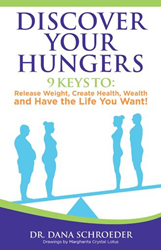 Dr. Dana Schroeder’s new guidebook, “Discover Your Hungers: 9 KEYS TO: Release Weight, Create Health, Wealth and Have the Life You Want!” (published by Balboa Press), shares practical advice, personal stories and powerful tools that will help those challenged with weight issues to release the pounds, reconnect to their dreams and attain fulfillment. Schroeder helps readers understand what is holding them back, how they self-sabotage and then what they can do to turn things around. The author discovered the techniques to dealing with food addiction throughout the course of 18 years as a bariatric professional who has worked with thousands of extremely obese people, before, during and years after weight loss surgery. In her experience of working with weight loss surgery patients in support groups, online courses, workshops and live events, many people who have struggled with excess weight benefitted from her method of coaching. Schroeder herself found weight loss surgery in 2001 a catalyst for change, releasing forever 120 pounds after being morbidly obese for over 20 years. The book is available for purchase at: https://www.amazon.com/Discover-Your-Hungers-Release-Weight/dp/1982215240. Dr. Dana Schroeder, PhD, is a bariatric nurse practitioner and the CEO and co-founder at Bariatric Wisdom who has worked with thousands in the weight loss community over the past 18 years, not only as a professional, but also as a weight loss surgery graduate. The collective wisdom gathered from those who have experienced this life transformation is what fuels her passion for life and success coaching. She has published several research studies on morbid obesity with peer coaching and the importance of support groups in long-term success after weight loss surgery. Schroeder resides in the San Francisco Bay area.